Product prices and availability are accurate as of 2019-04-25 11:36:24 EDT and are subject to change. Any price and availability information displayed on http://www.amazon.com/ at the time of purchase will apply to the purchase of this product. 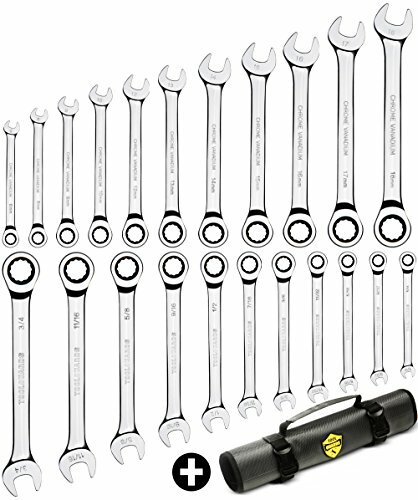 Shade tree mechanics and skilled tradesmen alike need efficient, reliable wrenches for a variety of tasks. ToolGuards Combination Ratcheting Wrenches have slimmer profiles to get you into tight nooks and crannies. Standard and metric measurements ensure that you have the right tool to tackle any screw or bolt. ToolGuards professional grade Ratchet Wrenches are made of high strength Vanadium steel and then chrome finished for long lasting durability. 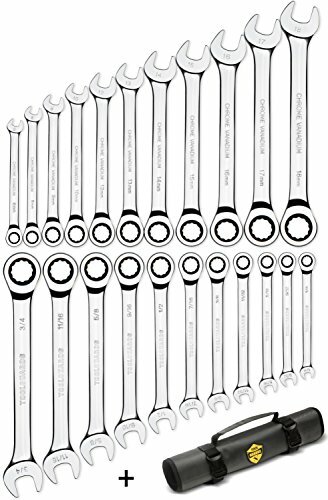 This comprehensive collection of open-ended and ratchet wrenches is a must-have for your roadside emergency kit. They roll up neatly in an organizer bag for storage in your car trunk or mechanics gear. 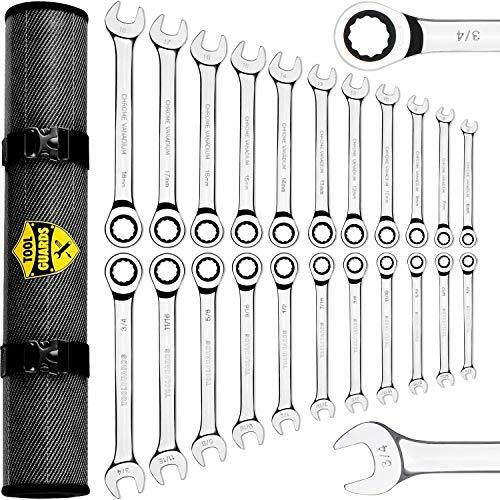 ToolGuards 22-Piece Ratchet Wrenches Set should be on your shopping list of gifts for your dad or husband. 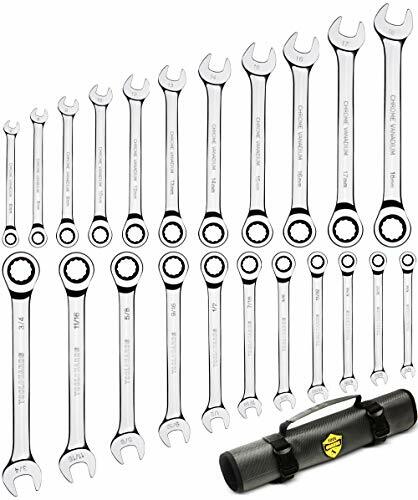 We insist on the highest quality materials and manufacturing processes to bring you this deluxe socket wrench set. We confidently offer a Lifetime Warranty against manufacturer defects, as well as honoring the Amazon 30 Day No-Questions-Asked Money Back Guarantee for your peace of mind. Let us get you out of a tight spot with home and auto repairs. 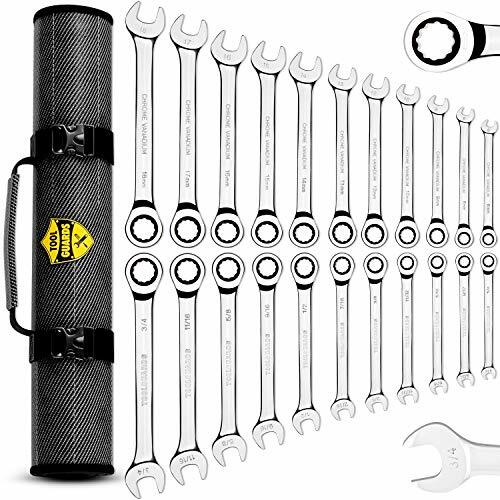 Add the ToolGuards 22-piece Ratchet Wrench Set to your cart today. 22 PIECE CHROME VANADIUM STEEL SET with mirror finish Includes SAE and metric combination wrenches. This deluxe set makes emergency repairs a breeze. SLIM PROFILE and 12-degree offset box offer superior knuckle clearance. The 72-tooth ratchet gears need only a 5-degree working swing arc. Full-drive box ends deliver reliable torque to tighten or loosen any bolt without rounding. 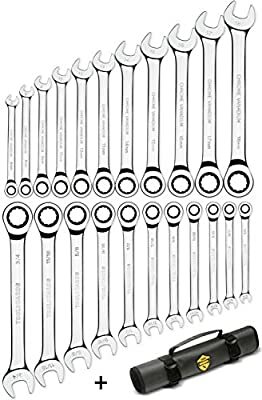 11 METRIC WRENCHES + 11 SAE WRENCHES Include 6mm, 8mm, 9mm, 10mm, 12mm, 13mm, 14mm, 15mm, 16mm, 17mm and 18mm; 1/4?, 9/32?, 5/16?, 11/32?, 3/8?, 7/16?, 1/2?, 9/16?, 5/8?, 11/16? and 3/4?. Total of 22 wrenches. GET BONUS TOOL ROLL TODAY for easy protection and storage of your ToolGuards Ratcheting Wrenches. LIFETIME WARRANTY insures your ToolGuards Wrenches purchase against manufacturer defects.